It's my birthday weekend, so I'm not sure if I'll have time to take new photos and write up new reviews. In the meantime, please enjoy my extended review of some HARE polishes previously featured on my Tumblr. As is usually the case with polishes previously featured on Tumblr, there is only one photo of each polish and some of the photos are completely awful haha. First up is the best photo of the bunch. The red is HARE Polish A Positive and the purple is HARE Polish Pegasus (both are from the re-release). 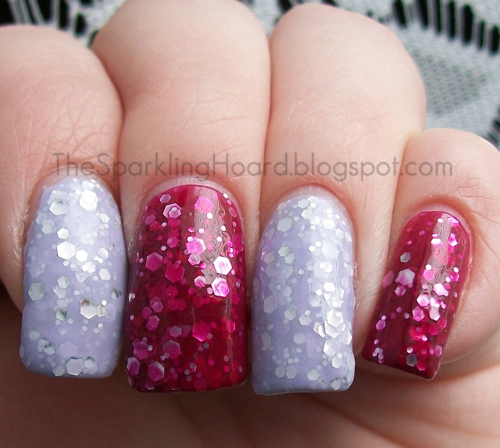 A Positive is a rich, pink-toned red jelly packed with various sizes of silver hex glitter. Pegasus is a pale purple crelly packed with what appears to be the same glitters as those found in A Positive. A Positive took only 2 coats to reach full opacity, but Pegasus took 3 coats. As far as formula goes, they were about the same. These polishes are thick and can be tricky to work with. The glitter also tends to clump together. Next up is the re-release of Bisbee. 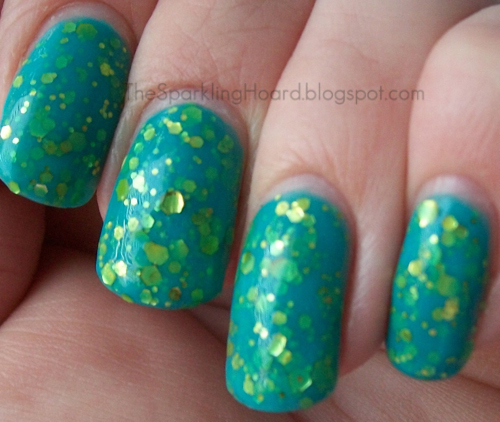 Bisbee is a bright teal crelly packed with gold glitter. The first Bisbee I received had curling glitter. I got a replacement, which somehow ended up being even worse than the first. It had both curling glitter and connected glitter, which caused a lot of clumping. Since both the original and the replacement were defective, Llarowe gave me a refund. I did either 2 or 3 coats of Bisbee. And now, the worst photo of the bunch lol. 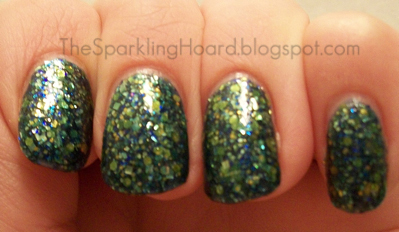 HARE Polish Golden Years is a dark blue (possibly a bit teal) jelly filled with gold, silver(? ), and blue hexes and squares in various sizes. Golden Years was very thick and tricky to apply, but thinner did help a bit. Shown is 2 coats. You can buy HARE Polish at Llarowe and on Etsy. You can stay up to date on HARE Polish news on Facebook and on their blog.